Metachromatic leukodystrophy (MLD) is a genetic disorder that affects nerves, muscles, other organs, and behavior. It slowly gets worse over time. MLD is usually caused by the lack of an important enzyme called arylsulfatase A (ARSA). Because this enzyme is missing, chemicals called sulfatides build up in the body and damage the nervous system, kidneys, gallbladder, and other organs. 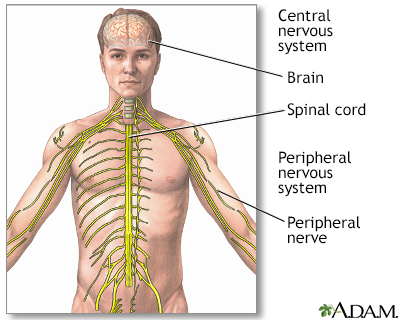 In particular, the chemicals damage the protective sheaths that surround nerve cells. The disease is passed down through families (inherited). You must get a copy of the defective gene from both your parents to have the disease. Parents can each have the defective gene, but not have MLD. A person with one defective gene is called a "carrier." Children who inherit only one defective gene from one parent will be a carrier, but usually will not develop MLD. When two carriers have a child, there is a 1 in 4 chance that the child will get both genes and have MLD. Late infantile MLD symptoms usually begin by ages 1 to 2. Juvenile MLD symptoms usually begin between ages 4 and 12. Adult (and late-stage juvenile MLD) symptoms may occur between age 14 and adulthood (over age 16), but may begin as late as the 40s or 50s. The health care provider will perform a physical exam, focusing on the nervous system symptoms. There is no cure for MLD. Care focuses on treating the symptoms and preserving the person's quality of life with physical and occupational therapy. Bone marrow transplant may be considered for infantile MLD. Research is studying ways to replace the missing enzyme (arylsulfatase A). MLD is a severe disease that gets worse over time. Eventually, people lose all muscle and mental function. Life span varies, depending on what age the condition started, but the disease course usually runs 3 to 20 years or more. People with this disorder are expected to have a shorter than normal lifespan. The earlier the age at diagnosis, the more quickly the disease progresses. Genetic counseling is recommended if you have a family history of this disorder. Kwon JM. Neurodegenerative disorders of childhood. In: Kliegman RM, Stanton BF, St. Geme JW, Schor NF, eds. Nelson Textbook of Pediatrics. 20th ed. Philadelphia, PA: Elsevier; 2016:chap 599. Pastores GM. Lysosomal storage diseases. In: Swaiman KF, Ashwal S, Ferriero DM, Schor NF, eds. Swaiman's Pediatric Neurology. 5th ed. Philadelphia, PA: Elsevier; 2012:chap 36. Reviewed By: Anna C. Edens Hurst, MD, MS, Assistant Professor in Medical Genetics, The University of Alabama at Birmingham, Birmingham, AL. Review provided by VeriMed Healthcare Network. Also reviewed by David Zieve, MD, MHA, Isla Ogilvie, PhD, and the A.D.A.M. Editorial team.